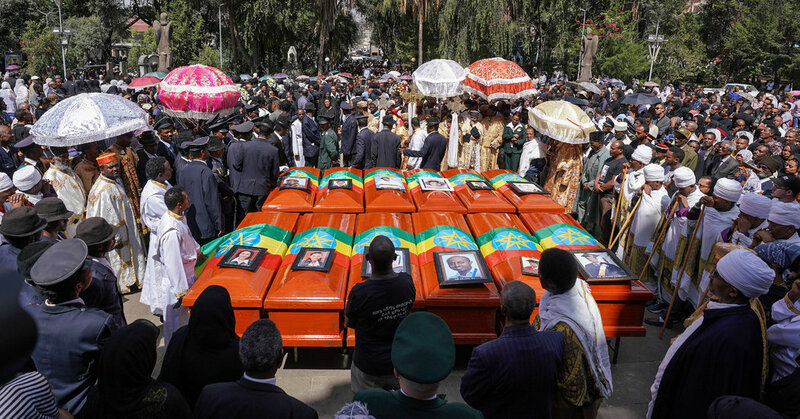 ADDIS ABABA, Ethiopia — The Holy Trinity Cathedral in Addis Ababa, the Ethiopian capital, echoed with the wailing of the bereaved on Sunday morning. Mourners dressed in black had streamed into the vast churchyard, waving pictures of loved ones who died in the crash of Ethiopian Airlines Flight 302 a week earlier. But the mourners did not have bodies to bury. Many families do not expect ever to recover remains. The victims died in a fiery explosion when the plane hurtled to the ground minutes after takeoff, killing all 157 people — crew and passengers — aboard. In lieu of remains, witnesses have said, officials gave relatives scorched earth from the crash site. On Sunday, empty coffins made their way into the churchyard on black vans while women beat their chests and screamed in anguish. An investigation is underway to determine the cause of the crash of the Boeing 737 Max 8 jet near Addis Ababa last weekend, and it is likely to take months. Over the weekend, French investigators said they had successfully downloaded audio from the cockpit voice recorder and transferred it to their Ethiopian counterparts. The accident was the second time a Boeing Max 8 had crashed in less than five months, raising a host of questions about the safety of the aircraft and the training — or lack of information — given to pilots around the world. The crash prompted multiple nations to ground the Max 8 until Boeing could verify the aircraft’s safety amid growing concern about what appears to have been a struggle by the pilots of Flight 302 to control the plane minutes after takeoff. Families of the Ethiopian victims have visited the site of the crash to see the wreckage for themselves. The passengers aboard that day had come from more than 35 countries and included at least 22 employees of United Nations-affiliated agencies. Kenya suffered the single largest toll: at least 32 dead. In Addis Ababa, mourners have sat in tents all week to receive visitors, in keeping with Ethiopian tradition. At the memorial, priests chanted a prayer for the departed. The patriarch of the Ethiopian Orthodox church, Abune Mathias, called out the names of the nine Ethiopian passengers and seven airline employees — including the captain, Yared Getachew, 29 — whose lives were being honored. “This is so the families and friends can accept the end, so they can move on,” said Samson Seyoum, 49, a humanitarian worker who had lost a friend of two decades, Getnet Alemayehu, in the crash. Mr. Getnet, who worked for the charity Christian Relief Services, had been flying to Nairobi, Kenya, for a training course when he died. A separate memorial was held at a Muslim burial site for the co-pilot, Ahmed Nur Mohammod Nur. Later, while the empty coffins were lowered into the ground at the church, the captain’s father, a dentist, muttered words of encouragement to other pilots who had come to offer their condolences. He looked dazed. His private grief had become a public fixture. As Boeing faces global scrutiny about the plane, some relatives of the victims — 18 of whom were Ethiopian — have hesitated to blame the manufacturer for the tragedy. Mr. Seyoum, who is a frequent flier on Ethiopian Airlines, noted Boeing’s long record of safety and its decades-long partnership with the carrier, which is a source of fierce pride for the nation. Not everyone shared his views. Yonathan Menkir Kassa, a pilot and aviation writer who attended the memorial, said Boeing had departed from its ethos of safety when it resisted global calls to ground the Max 8 planes immediately after the Ethiopian crash. By noon, the memorial had wrapped up and the mourners were streaming out onto the busy street. In the sea of black, men and women wearing T-shirts with the pictures of the crash victims emblazoned on the front and Bible verses across the back stood out. “My days are swifter than a weaver’s shuttle, and they are spent without hope,” one T-shirt read.